Over the past few years, the SEARCH (Study of Environmental Arctic Change) and ARCSS (Arctic System Science Program) communities have discussed the increasing need for improved integration and coordination between the two programs and their respective planning processes. Recently, the SEARCH Science Steering Committee (SSC) and ARCSS Committee agreed to move forward with a joint process to align efforts for more efficient scientific planning and implementation and to explore scientific synergies through a SEARCH-ARCSS task force on "understanding arctic change." The Understanding Arctic Change Task Force will lead community activities to establish a long-term vision and provide the scientific framework for a modern effort for understanding the arctic system. This effort will outline an approach that facilitates a broad array of activities—from individual proposals, to synthetic workshops, to comprehensive research programs—to better address current scientific challenges in a rapidly changing arctic system. This group (see box below for members), with input and review from the broader community, will identify needs for accelerated community capacity-building and understanding of the rapidly changing arctic system. The task force will have a term of one year. 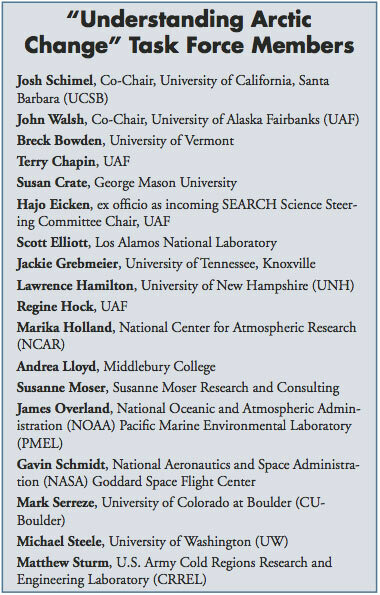 The central product of the task force will be a community white paper to: identify key scientific unknowns and obstacles to advances in understanding arctic system change; and identify the next steps in synthesis activities, methodologies, mechanisms, and approaches to address the identified key science questions. The white paper will be developed with open community comment and review and is expected to be complete in December 2010. These activities will result in improved integration between the current SEARCH and ARCSS efforts, advance SEARCH "Understanding Change" activities, and improve our understanding of the arctic system. The process is designed to allow ideas and vision to grow from the scientific community and inform viable research programs. The result will include identification of key scientific and structural needs, with a range of activities emerging to address those needs, and a focus on nimble and decentralized structures. With the formation of the task force, the existing ARCSS Committee will cease to exist, and ARCSS-relevant science planning activities will be addressed in the short-term by the ad hoc task force. The longer-term structure and activities will be developed as task force activities are completed, with guidance from the broader science community. Updates on the SEARCH-ARCSS Understanding Arctic Change Task Force will be posted to the SEARCH website as information becomes available (www.arcus.org/search/index.php). For more information, contact the task force co-chairs Josh Schimel (schimel [at] lifesci.ucsb.edu) or John Walsh (jwalsh [at] iarc.uaf.edu), or Helen Wiggins at ARCUS (helen [at] arcus.org).